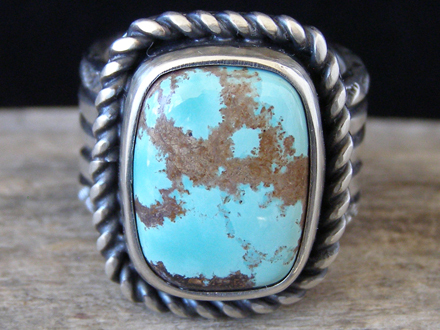 Roy Tracy is a Navajo silversmith who works in the traditional style making jewelry with heavy silver which has deep stamping. His grandfather Descheeny Nez Tracy was the son of a Navajo woman and Don Lorenzo Hubbell who ran the famous Hubbell Trading Post at Ganado, Arizona. This ring shows Roy's typical heavy Sterling shank with deep-stamped motifs. A soft-cornered rectangle of natural, untreated Number Eight turquoise is set in a smooth bezel wrapped with heavy, roped twist wire. Beautifully made and exhibiting the kind of heft that a fine piece should. Hallmarked ROY with a T laying horizontally on its side. Stamped Sterling inside the shank. Ring face: 1" x 7/8"